3G/4G mobile data plans designed for M2M and IoT Devices, that are tailored to your needs. Whatever your application, we will help you connect your devices to New Zealand’s most reliable 3G/4G mobile network. Never pay excess usage charges with our Individual Data plans, thanks to our CAP Guarantee. Each SIM has an individual monthly fixed data allowance, when the SIM reaches it’s allowance the data plan is disabled. If you still need to use the SIM after it capped, you can contact us at any time to move it to a larger plan or simply wait until the end of the month when your SIMs data allowance will be automatically reset. 4x 5MB SIM Cards each have individual data 5MB allowances. Looking for some flexibility with your plans? Our flexible plans are a perfect option for devices with varying usage patterns. With a flexible plan, every SIM on the same plan type groups together to create an effective “Pool” of flexible data. If your SIMs exceed the total pooled allowance, they will still keep operating but will result in excess usage charges that are billed at a per KB rate. You can contact us at any time about upgrading data plans to avoid excess charges. 4 x 5MB SIM cards gives you a flexible pool of 20MB to share. Data plans ranging from 0.5MB to 50MB are ideal for low use M2M/IoT applications that send and receive small packets of data and transmit infrequently or by exception. A majority of these devices rely on data saving methods like using UDP as a transmission protocol or static routes to reduce their overall device traffic. Automated Meter Reading – Electricity, Gas and Water Smart Metering. 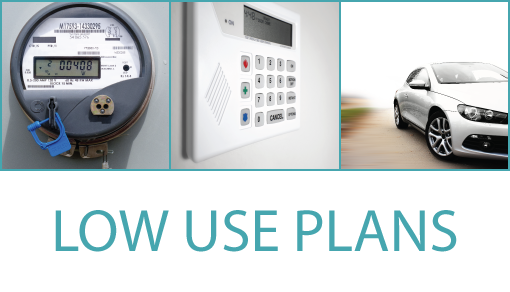 Security – IP Alarm systems, Geofencing, perimeter alarms and asset tracking. Vehicle Tracking & Telematics – Periodic vehicle information, GPS tracking and vehicle alerts. Data plans ranging from 100MB to 300MB are ideal for medium use M2M/IoT applications, typically these devices send and receive larger packets of data and regularly. A majority of these devices will use the open internet as their primary communication method and tend to transmit using TCP. Vending – Electronic payments, stock management and coin counting. Retail – Point of sale terminals, ticketing systems and inventory control. Vehicle Tracking & Telematics – Real time vehicle tracking, remote diagnostics and reporting. 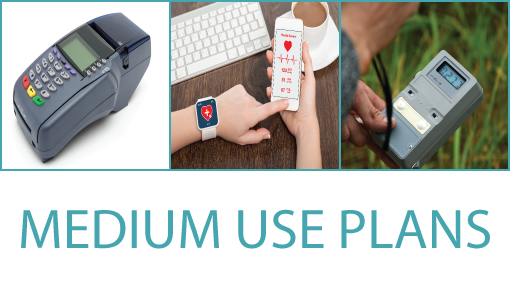 mHealth or Telehealth – Patient monitoring, SOS alarms, remote diagnostic and administration. Environmental Monitoring – Wildlife tracking, natural disaster monitoring and water treatment systems. Data plans ranging from 500MB to 4GB are ideal for high use M2M/IoT applications. These are devices that typically allow the user real time access to a remote location, transferring large files or streaming content. Industrial Monitoring and Control – Connecting industrial PLCs and RTUs to supervisory or SCADA systems. 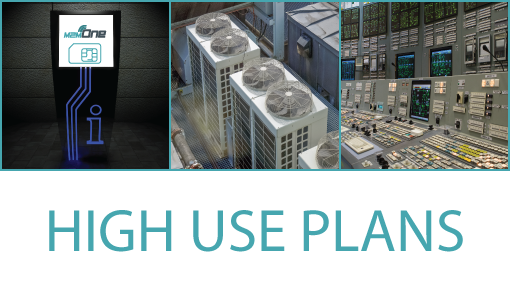 Building and area management – Large networks of smart meters using a concentrator and managing building systems like heating, ventilating, and air conditioning (HVAC). Data plans ranging from 5GB to 10GB are ideal for the highest bandwidth M2M/IoT applications. These are typically devices that are on 24/7 and transmit or stream high volumes of data and information. Backup & redundancy – Replacing fixed line with wireless communications, wireless backhaul and redundant backup links. Security – Video surveillance systems for assets or buildings. 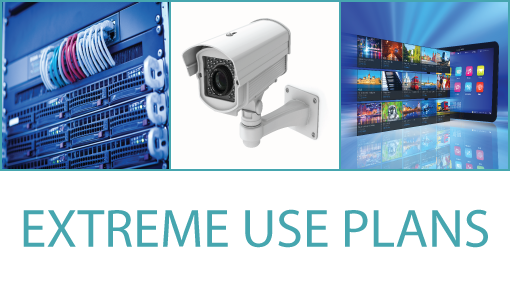 Entertainment – Streaming high quality video to digital signage, tablets or for broadcast. What features can I add to my M2M Data plan? SMS Mobile Terminating (MT) – SMS Messaging sent to and received by your SIM/Device from an outside SIM, there is no charge for our SIMs to receive SMS. Voice – M2M One offer voice services, phone your SIM/Device, or allows your SIM/Device to make phone calls. Mobile Originated (MO) voice calls are charged at a casual rate per minute, and we can offer monthly voice packs (10min, 20min, and 30min packs). Roaming – M2M One can offer roaming data plans on our SIM Cards to assist with off-shore manufacturing and testing. At present we have roaming options for Australia and USA. Still not sure how much data your M2M/IoT device needs? Or maybe you just want to talk through some options. Feel free to contact M2M One any time for help.